Rog and I decided to spend Christmas Day at the Werribee Sewage Farm. The weather was warm, there were no crowds, the birds were prolific: a perfect Christmas Day! We arrived at 9.30, and left at 2.00, having seen 71 species. The highlight was probably a Cox's Sandpiper, which was in T Section Lagoon Pond 4, along with some Sharp-tailed Sandpipers. We saw some Dusky Woodswallows as we drove down Pt Wilson Road to the Murtcaim Wildlife Area, hoping for Brolga. This area was very dry and there was no hint of Brolga. Next stop was the T Section Lagoons, where we admired Baillon's and Australian Spotted Crakes walking happily amongst the reeds. There are always Australasian Grebes around here, and today there were thousands of Whiskered Terns. Of course we saw and heard Golden-headed Cisticolas and saw hundreds of Australian Shelducks. In fact we had ten species of ducks during the day.﻿ Just one pair of Cape Barren Geese stood at the water's edge, not doing anything much, as sandpipers and stints played on the mud. From T Section Lagoons, we drove to Western Lagoons, hoping for a Lewin's Rail, which had been seen here with some cute black fluffy chicks a fortnight ago. We dipped on the rail, but we saw a Curlew Sandpiper in full breeding beauty, which was some compensation. There were thousands of waders here, mainly Red-necked Stints, but also plenty of Sharp-tailed Sandpipers and a few very handsome Red-kneed Dotterels as well as a small covey of Common Greenshanks. A couple of Black-winged Stilts stood with the greenshanks, the stilts' bright pink legs confused with the greenshanks dull green legs, making me reach for my binoculars to confirm that I didn't have a redshank amongst the throng. Of course it would have been too good to be true. We saw three other cars during the course of the day. We said 'Merry Christmas' to a couple at the Western Lagoons, and they said that they'd flushed a Brolga by the gate. It had flown back to the T Section. So, as we left the Western Lagoons, we scanned the T Section and sure enough, two regal Brolga stood beside our lazy Cape Barren Geese. Then we drove down Beach Road to the boat ramp, adding a few cormorants to our growing list. We decided against the rough road to Kirk Point, knowing that we were foregoing the possibility of Pacific Golden Plover. Instead we drove along the coast road and down to the bird hide. Everywhere we looked there were hundreds of waders. There were several Great Crested Grebe in the river as we drove to Paradise Road, but there was little to see at Paradise. In fact, I don't remember ever seeing so few birds there. Then it was on to the Borrow Pits for a bottle of bubbly and lunch. We were surprised and delighted to see that a couple of seats had been installed for our comfort. We ate our sandwiches watching terns, dotterels, avocets and stilts, while Silvereyes sang from above. Did anyone ever have a better Christmas feast than this? Yesterday I spent a pleasant hour wandering around Melbourne's Botanic Gardens. It was warm and sunny with just a slight breeze. If I were forced to find a complaint, it was that it was too popular. There were too many people enjoying what I wanted to enjoy! I used to visit the gardens to add Song Thrush and Nankeen Night-Heron to my list, but it has been many years now since I've seen a Song Thrush in the Melbourne Botanic Gardens. Nor did I see a night-heron yesterday. One bird that is guaranteed today is the Bell Miner. I saw plenty of them. And, as on last Monday when I visited the Melbourne General Cemetery, the most numerous bird was the Red Wattlebird. I heard, but could not see, the Eastern Koel. Until recently, koels were not regarded as Victorian birds at all. In his authoritative Handlist of the Birds of Victoria published in 1967, Roy Wheeler classifies the koel as an accidental summer migrant and records just one record, from Mallacoota in January 1917. Then, ninety years later, in January 2007, one turned up in the Melbourne Botanic Gardens. He liked it so much that he now takes his summer break there each year. Yesterday, he called from the top of a conifer. I hurried up the hill and, as soon as I reached the tree, he stopped calling. He had fun with me a few other times during the morning, but always remained hidden. My birdlist was surprisingly small. I was missing all the little birds. I don't know how I missed the Grey Fantail that serenaded me loudly, but simply would not show himself. I also heard, but did not see, Brown Thornbills, Superb Fairy-wrens, White-browed Scrubwrens and an Eastern Spinebill. No wonder my list was small! I always hope for crakes in the gardens, but am rarely gratified. I did not see any yesterday. I saw all the usual suspects, the common waterbirds, blackbirds, currawongs, Little Ravens, and again, my favourite, the Willie Wagtail. It is great to see the people of Melbourne enjoying their botanic gardens. Perhaps if I allow a little more time on my next visit, I might see that pesky koel. And I'll never give up on the Song Thrush. Yesterday I visited the Melbourne General Cemetery for a spot of birding. This is not one of Melbourne's top birding spots - no, it does not make it into my best 100 sites - but it suits me to go there. It is an interesting place to walk around, lots of historic headstones to admire if the birds don't perform, and I have seen some good birds there. 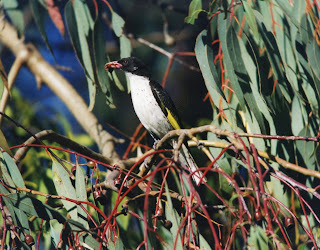 For example, I've seen Yellow-tailed Black-Cockatoos, Tawny Frogmouths and a Little Eagle. I wasn't quite that lucky yesterday. The first bird to greet me as I entered the gate was a Red Wattlebird. 'Kwok!' he asserted and I agreed. Wattlebirds were the dominant bird of the morning, mainly red ones, but also Little. I suspect that Little Wattlebirds are extending their range. I lived in this vicinity for twenty years and they were not commonly seen then. Today they are easily observed. The next most common bird was the Little Raven. Flocks flew overhead, cawing. They played in the cyprus trees and on the ground. I lost count of how many I'd seen. I tried to check out each bird to ensure that they were all Little Ravens, and no Australian Ravens had crept into their ranks. Then, came magpies. Two families had full size young begging constantly. There were also a couple of free flying, apparently unattached males, soaring overhead, calling occasionally to make sure I noticed them. I did not see anything particularly startling yesterday. However, I saw my favourite bird (Willie Wagtail) so I was happy. I always see Yellow-rumped Thornbills, Rainbow Lorikeets and Welcome Swallows and I usually see Galahs, Crested Pigeons and New Holland Honeyeaters. Yesterday I was surprised to miss out on Superb Fairy-wrens, White-plumed Honeyeaters and Silvereyes. I managed 18 species in about 45 minutes, which is okay for a site without water so close to the city. Anyway, I was happy. I'm always satisfied if I see a Willie Wagtail. On Saturday I went to the You Yangs to pull out boneseed. The weather was perfect, the company was convivial and the birds were wonderful, as usual. 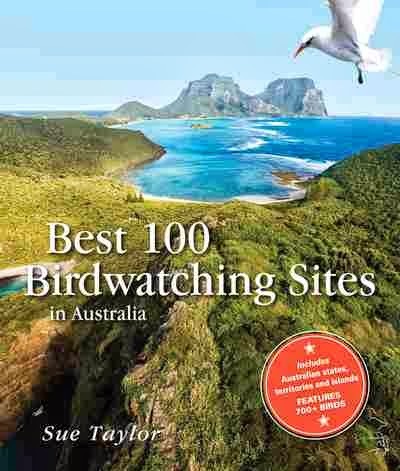 The You Yangs Regional Park is number 31 on my Best 100 Birdwatching Sites in Australia, and the birding is great. We go to the You Yangs once a quarter, so birders have usually done some interesting trips between visits, and I enjoy the birdy gossip as much as the birds. Boneseed is an invasive weed from South Africa and these outings are arranged by BirdLife Australia to keep our allocated patch boneseed free. The You Yangs Regional Park is 55 kilometres south-west of Melbourne off the Geelong Road via the township of Little River. It is dry eucalypt woodland, with several small dams, so the birdlist features bush birds and waterbirds. We start the day birding around the car park, then go to Gravel Pit Tor. We have lunch at a picnic table beside a small waterhole, then do some more birding around that site. In the early afternoon we pull out some boneseed, then finish the day with more birding at East Flat. It's obvious that the weeding is just an excuse for our primary activity: birding. The You Yangs are famous for Tawny Frogmouths and, in autumn and winter, Swift Parrots. We didn't see any frogmouths on Saturday. 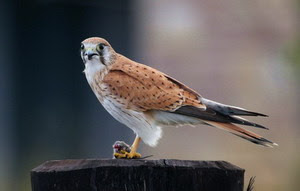 The resident pair, usually seen around the park office, have not been seen for some weeks. I expect they'll return one day. I hope it's in time for our next excursion in March 2014. The birdlist for the day is usually quite impressive. My personal list is always much smaller. I thought the best birds on Saturday were the Brown-headed and Black-chinned Honeyeaters together with (most unusually, just one) Varied Sittella. A pair of Scarlet Robins provided much pleasure and Rufous Whistlers entertained us all day. While I was boneseeding, I was serenaded by Yellow Robins, Olive-backed Orioles and Fantailed Cuckoos. It was difficult not to knock off work and look at the birds, but I always leave my binoculars in the car when we set to work, to lessen the temptation. Raptors can be quite good at the You Yangs, but the only one I identified with confidence on Saturday was a wedgie. He soared over us while we were having lunch, reminding us it was time to stop feeding our faces and go birding. Anyone is welcome to join us at the You Yangs on the first Saturday of March, June, September and December. All you need to bring is lunch, binoculars and enthusiasm! Most birders have a bogey bird - that's a bird that they've looked for on several occasions, but which continues to elude them. It's sometimes called a 'jinx bird.' I have five bogey birds, without counting the uncommon Common Redshank, that I flew to Broome (from Melbourne) to try to add it to my lifelist. I spent a (most enjoyable) week looking unsuccessfully for redshanks. 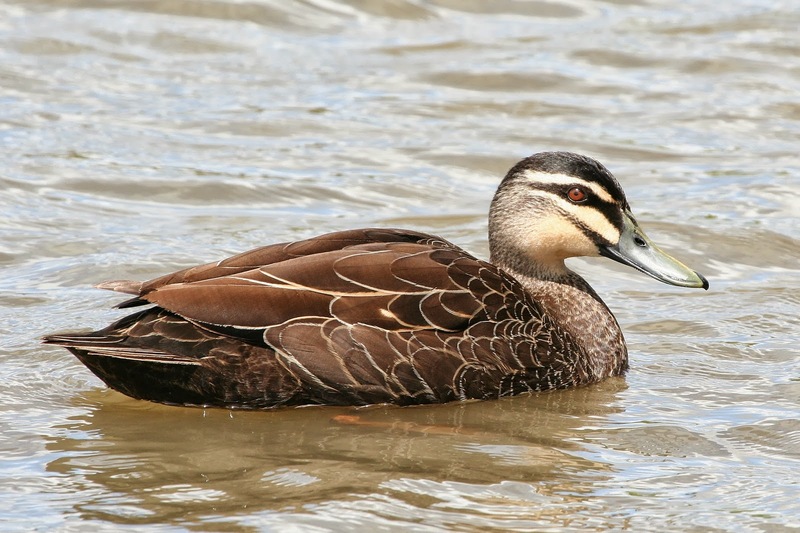 Under my definition, it won't become a bogey bird until I've flown to Broome (or Cairns or somewhere else) to look for it on several occasions. I live in hope that I will see it before it qualifies. Five bogey birds is quite enough! I'm sure I'm not alone in counting the Rufous Scrub-bird amongst my bogey birds. This notoriously difficult little bird is missing from many people's lists. I've heard it lots of times and looked for it seriously at both Gloucester Tops and Lamington on more occasions than I care to remember. Most recently, I spent several days looking at Gloucester Tops last April. I haven't given up on the Rufous Scrub-bird (I haven't given up on any of my bogey birds). 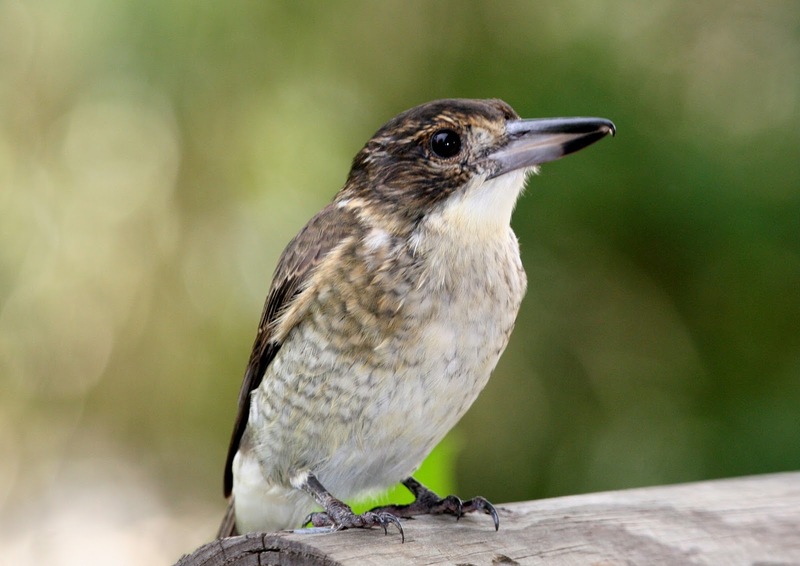 I'm planning a trip to Lamington National Park in October and hoping to see my Rufous Scrub-bird then. October is reportedly the best month to see them, when they are most vocal. However, I have looked in October before, so nothing is certain. Although there are three grasswrens missing from my lifelist, only one qualifies as a bogey bird. Looking for the White-throated nearly killed me, but I've only looked for it twice, so it doesn't qualify. And I've only looked for the Kalkadoon once, so it's a long way short of being nominated as a bogey. The one that does qualify is the Short-tailed Grasswren, which I have looked for every time I've passed through the Flinders Ranges. Stokes Hill is the favoured spot recently, but the grasswren has not favoured me there - yet. I'm hoping I might have another go next November. Perhaps the Black-winged Monarch isn't really a bogey bird, but it certainly feels as if it qualifies. It inhabits far north Queensland, north of Cooktown and I've been there four times. The first time I was just looking for birds, not specifically targeting the monarch, but I did look for it seriously in 1994, 2006 and 2008. Perhaps I'm stretching my own rules to include a bird I've only searched for on three occasions, but it is not a rare bird and I really feel I should have seen it by now. It's a bogey to me. My last two bogey birds are seabirds. 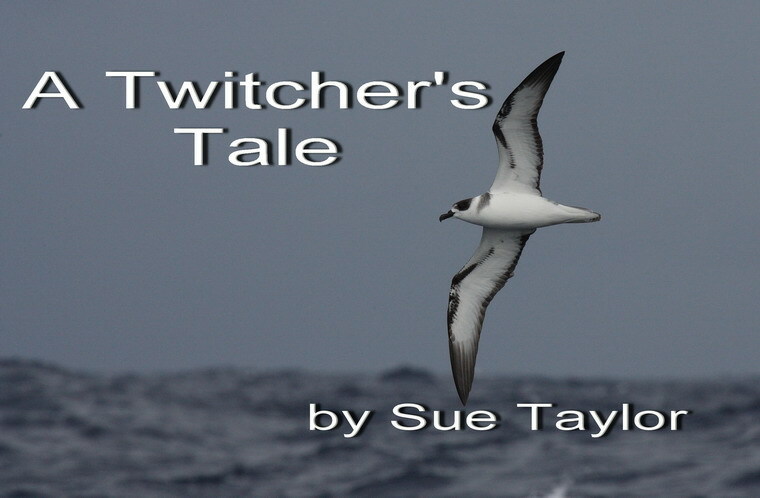 The first is the beautiful White-necked Petrel shown on my masthead. This superb photo was taken by Brook Whylie. 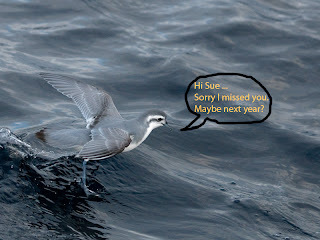 I've travelled to Wollongong in February or March (I think, without adding them up) six or seven times and to Port Stephens in April twice, targetting the White-necked Petrel. In April 2012 I dipped on the bird on a Saturday trip. The boat went out (without me) on Sunday and saw it. Such is the luck of birding. I will keep going until I see it. On the law of averages, I really should tick it soon. Yes, my final bogey bird is the Slender-billed Prion. I hope for prions on every winter pelagic I do. 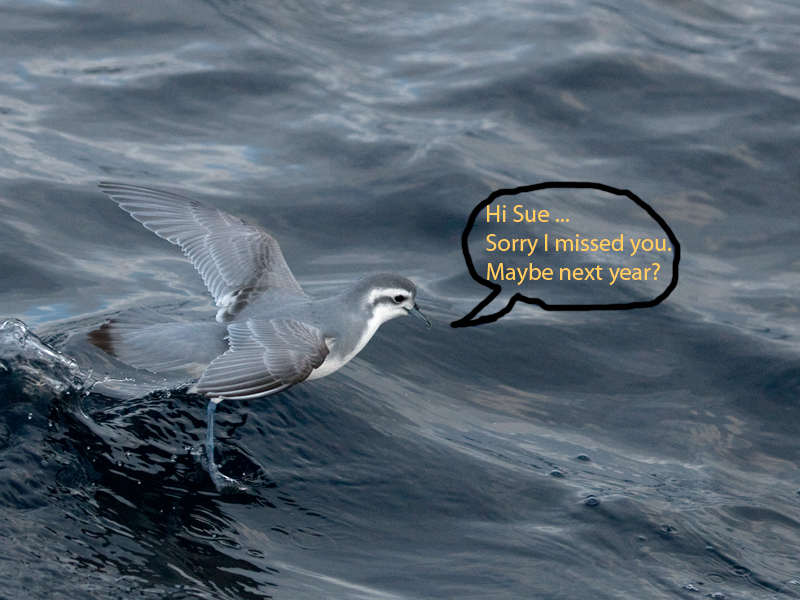 Luckily, I managed to tick Broad-billed, Antarctic and Salvin's on a ghastly yacht trip out of Hobart in July 2009. I earned those birds! But I didn't get a Slender-billed, which should be the easiest of the lot. I travelled to Port MacDonnell hoping for a Slender-billed Prion in June 2012. The weather was foul and the boat did not go out. Rog and I drove over again this June. The boat did go, but we saw only Fairy Prions. 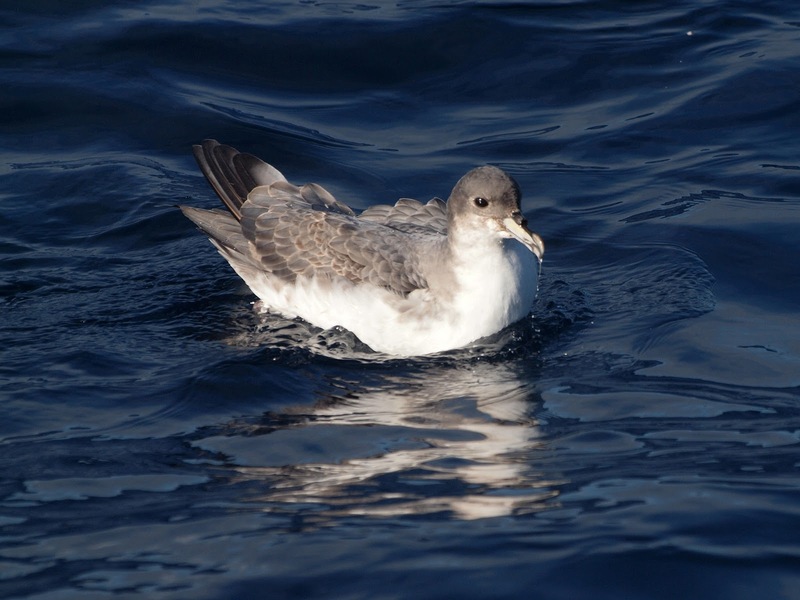 We had great views of a Grey Petrel, which satisfied everyone on board except me! The same boat went out this month and saw several Slender-billed Prions. Thanks to Grant for this tantalizing photo. I'm off to Port Fairy next Sunday and if there is any justice in the world, I will see my Slender-billed Prion then. Then I'll only have four bogey birds to worry about. I haven't been birdwatching this week, so instead of reporting about the birds that have come to have a drink at my water, I thought I'd share my Laws of Birdwatching. I recently referred to my third law, so I thought it might be worth giving you them all. Here goes. 1. 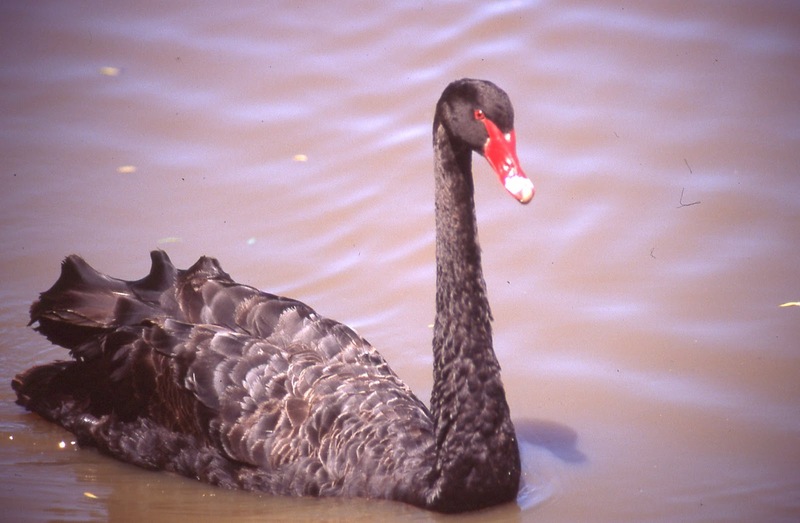 The bird you saw was common - unless you can prove otherwise. There is no exception to this rule. 2. If you're uncertain about you bird's identification, it was probably what you first thought it was. Whatever it was, it must have been common. 3. The more gorgeous a bird's plumage, the less melodious the song; and conversely, the more drab the plumage, the more mellifluous the song. The European exception to this rule is the gorgeous Golden Oriole, which includes a loud, fluty yodel amongst his repertoire. The American exception is the colourful Cardinal, that sings beautifully. And the Australian exception is the Golden Whistler. 4. When males and females of a species duet, they look the same. The exceptions are Europe's Linnet and Australia's Magpie-lark. 5. 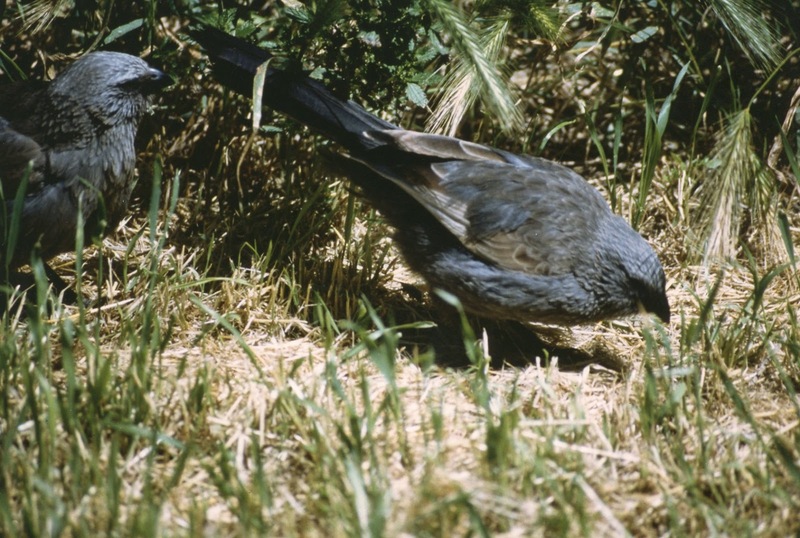 Where males and females look different, the plainer bird rears the young. When the sexes look alike, they share parenting. The exception to this rule is the South American Chachalaca, where both sexes look the same and the female is left to do all the parenting alone. 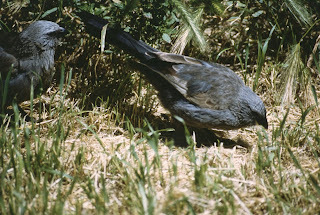 Where the sexes look alike (such as these Apostlebirds) they share parenting. 6. Birds won't nest in trees or shrubs that are flowering or fruiting. You'll have fun finding your own exceptions to this rash generalisation. Personally, I haven't found one yet. I don't think the Californian Phainopepla that nests in trees with fruiting mistletoe really counts. 7. Birds that nest in dark hollows lay white, rounded eggs. The exception is Australia's treecreepers that lay glossy googies, which are splotched brown. 8. Migrating birds always breed in the colder area. The exceptions to this rule are Arctic Terns that breed in the Artic then migrate to the Antarctic, and some Eurasian Curlews that breed on continential Europe then winter in Iceland. 9. Nocturnal birds have large eyes to allow them to see well at night. The exception is New Zealand's kiwis that have tiny eyes: they feed by touch and smell. I had been told that if I did a pelagic out of Port MacDonnell in June, I'd be likely to see lots of prions. Specifically, I am looking for a Slender-billed Prion. In June 2012, Rog and I drove over to Port MacDonnell (which is in the extreme south-east of South Australia, just south of Mt Gambier) for this purpose, only to find that the trip was cancelled due to bad weather. This year I hoped I'd be luckier. I was - in a way. The trip wasn't cancelled. But I didn't get my prion either. We set off on Wednesday for a leisurely drive to Port Fairy. It was cold and drizzly all day. 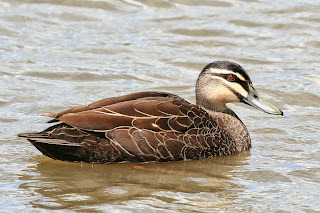 First stop was Point Addis to get the Rufous Bristlebird on my annual list, then lunch at Colac while we admired lots of Pink-eared Ducks and just one lonely Freckled Duck on the lake. Thursday was again cold, wet and windy - not good weather for looking for Hooded Plovers, so we drove to Tower Hill and admired Australian Shelducks roosting on the cliff face, as if they were raptors. Of course we saw Emus, but it was a bit wet for walking, and we didn't see much else. 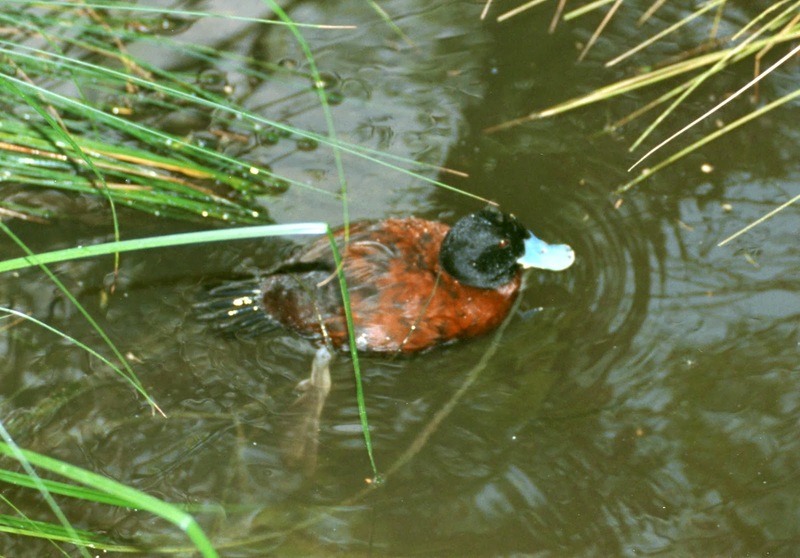 Back in Port Fairy, I enquired at the Information Centre about the location of the Powling Street Wetlands, where a housing development is threatening Latham's Snipe habitat. The helpful man gave me a map and also volunteered the fact that the snipe roost at Goose's Lagoon, a wildlife refuge on the road to Yambuk. The Powling Street Wetlands are surrounded by houses (and presumably pets). I have written to Tony Burke, Federal Minister for Environment asking why the housing development has been given approval. It will be most interesting to see what response I receive. ﻿Friday was again cold, grey and windy. We drove to Mt Gambier, stopping at Lower Glenelg National Park. Along the way we saw a Spotted Harrier and in the park, we saw a Brush Bronzewing and a couple of Australian Spotted Crakes on the river. On Saturday, we pottered about Port MacDonnell. I did a pleasant walk in Germein Reserve where the yellow gums were flowering profusely and the New Holland Honeyeaters were making the most of it. Silvereyes, Red-browed Finches and Grey Fantails were all bathing in the puddles. I thought it was a bit cold for a bath. At last, it was Sunday, the day I had waited for for twelve months. It was still quite dark when we left at 6.15. Driving from Mt Gambier to Port MacDonnell, we saw an Eastern Barn Owl. I hoped it might be a good omen. The boat left right on the dot of 7. Remarkable is a large fishing boat, with just 12 passengers, so we had good views all day. And we saw some good birds, too; we just didn't see any Slender-billed Prions. 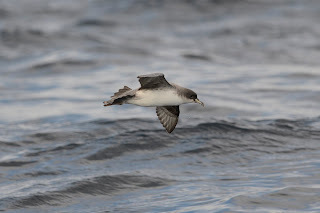 Most people on board saw an orca and a blue shark and everyone had great sightings of a very cooperative Grey Petrel. The petrel flew around the boat and landed near the burleigh, just to make sure everyone had a good look. We saw six species of albatross﻿, including two wanderers, both giant-petrels and quite a few Grey-backed Storm-Petrels. Some people saw a Little Shearwater, but for me it was just a tiny dot on the horizon. We saw a few Fairy Prions, and I tried my best to turn them into Slender-billed. There were Cape Petrels and one White-fronted Tern. I managed twenty species for the trip (not counting the Little Shearwater). Can you believe, they actually provided a barbeque for lunch? Monday was again raining. I told myself not to complain, it was, after all, winter. However the sun did manage to put in an appearance. 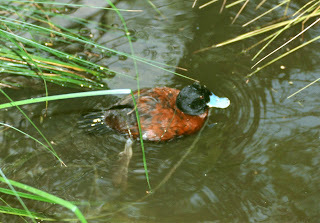 In Nelson, we saw a Great Crested Grebe and at Lower Glenelg National Park I saw a Baillon's Crake in the river. Then in Portland, at Fawthrop Lagoon, I saw a Little Egret, another new bird for the trip. On Tuesday morning, before we drove home, I made one last attempt at getting Hooded Plovers on my list. I was not successful, but I did see a Sooty Oystercatcher, bringing my trip total to 115 species, which, given the unfavourable conditions, I thought was okay. It looks like I will have to try for my Slender-billed Prions again in 2014. What a shame! An excuse for another trip to Port MacDonnell.